Glacier National Park known as the Crown of the Continent is located in Montana’s Rocky Mountains. The park includes pristine forests, alpine meadows, glacier-carved peaks, and spectacular lakes. Glacier National Park borders Waterton Lakes National Park in Canada — the two parks are known as the Waterton-Glacier International Peace Park. A highlight of the park is the Going-to-the-Sun Road. This scenic road cuts through the rugged terrain in an incredible feat of engineering. It is runnable, but very hilly in sections and also very crowded with cars in season — and often lacks a shoulder. If running on the Going-to-the-Sun Road, it is best to go early or off-peak (though the road is closed in season). 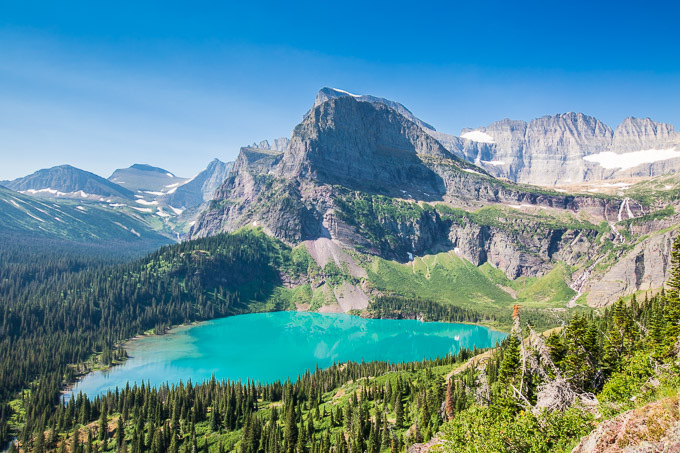 With over 700 miles of trails, Glacier is a hiker’s paradise for adventurous visitors seeking wilderness and solitude. Diverse wildlife ranges from mountain goats to grizzly bears. You are almost guaranteed to run into wildlife at some point in the park. NOTE: Glacier is bear, moose and mountain goat country, so special safety measures must be taken. Running is different than walking or hiking. When you encounter an animal at running speed, they are more likely to feel threatened. With so much wildlife in the park, it is not the ideal place for running. If you are going to run, Park Rangers recommend running in groups, making lots of noise, carrying bear spray, and choose trails that are open with good visibility and high traffic (like the one featured below). Before your first run or hike, check in at a Visitors Center or Ranger Station to learn about the current wildlife activity. Lake MacDonald, filling a basin gouged out by Ice Age glaciers, is the largest Lake in Glacier National Park. It is surrounded by mountains which provide a spectacular backdrop for a run. Stands of western red cedar and hemlock flourish in the valley of Lake McDonald. The wildlife-viewing here can be spectacular, with species including bighorn sheep, mountain goat, elk, black bear, and whitetail and mule deer. The Lake MacDonald Valley houses numerous campsites, lodges and shops. Park at the Apgar Visitor Center and hop on the paved Apgar Bike Path. Another option from this area is the Lake McDonald West Shore. This flat, well maintained dirt trail runs for 7 miles. The trail is easy to run on, provides amazing lake views but is very exposed to the sun. Hit the trail in the morning or evening to stay cool. Hidden Lake Trail. 2.5 miles one-way, total ascent 274 feet. This is one of the more ‘runnable’ trails in the park, in terms of footing and because of it’s popularity, it’s a less remote. It is open the whole way, with incredible lake and mountain views, and fields of wildflowers. From the Logan Pass Visitor Center, it’s 2.5 miles to the end at Hidden Lake, gradually uphill for the first half and more of a descent the second half. You can find definitely a whole lot of particulars like that to take into consideration. That is an incredible point to bring up. I offer the thoughts above as general inspiration but clearly you can find questions like the 1 you bring up where the most significant thing is going to be operating in honest superior faith. I don?t know if best practices have emerged around points like that, but I am confident that your job is clearly identified as a fair game. Both boys and girls really feel the impact of just a moment’s pleasure, for the rest of their lives. This is the suitable weblog for anybody who wants to seek out out about this topic. You notice so much its virtually exhausting to argue with you (not that I truly would want…HaHa). You undoubtedly put a new spin on a subject thats been written about for years. Nice stuff, simply nice! Magnificent website. Plenty of useful info here. I’m sending it to several friends ans also sharing in delicious. And naturally, thanks for your sweat! What’s Taking place i am new to this, I stumbled upon this I have found It absolutely helpful and it has helped me out loads. I’m hoping to give a contribution & aid different users like its helped me. Great job. You should take portion in a contest for one of many finest blogs on the internet. I will advocate this internet site! With every thing that seems to be building within this area, all your perspectives happen to be rather exciting. Nonetheless, I am sorry, but I can not subscribe to your entire plan, all be it radical none the less. It looks to us that your remarks are generally not totally justified and in fact you are your self not entirely confident of the argument. In any case I did take pleasure in examining it.